Big changes are coming to CPP, and we couldn’t be more excited. The cutting edge technical work that has defined us since 1981 now has an office environment to match. We have officially relocated CPP’s main offices to 2400 Midpoint Drive, Suite 190, Fort Collins, CO 80525. CPP’s main conference room features a glass wall and entry. Photo courtesy of Rieko Ishiwata of Burkett Design, lead architect for the project. After more than 30 years at our original location, CPP’s executives, engineers, and business support staff needed a modern environment that would better support the world-class engineering services we’ve performed since our founding. That’s why we decided to move most of our staff to a new space that would offer the sorts of state-of-the-art resources and capabilities our staff need and our customers demand. Furthermore, we realized that attracting top talent means offering a workspace that matches the expertise they bring to our organization. Moving to a new building presented us with a wonderful opportunity to create a space that wouldn’t just meet logistical requirements, but also nurture our culture of innovation and collaboration. Having before worked with Burkett Design, an architecture and interior design firm from Denver, Colorado, we knew their team could deliver the kind of space we were looking for. The architects and designers at Burkett Design delivered a space that fully expresses the cutting edge work we do every day. CPP’s new open workspace. Photo courtesy of Rieko Ishiwata of Burkett Design. Burkett’s ultimate design combines the collaborative potential of an open office plan with readily accessible private and semi-private areas that permit the kinds of deep concentration needed to solve the world’s toughest engineering problems. Rieko Ishiwata, lead architect for the project, created areas of focus to make the space more inviting. “We decided to build CPP’s new offices around a series of ‘landmarks,’ like a library and informal meeting areas, to disrupt what could otherwise have been an imposingly large room,” she explains. All staff have access to natural daylight thanks to large banks of windows on the exterior walls and glass doors on the handful of internal ones. Natural light increases comfort, reduces eye fatigue, and contributes to workplace efficiency. Where artificial lighting is needed, a mix of direct and indirect illumination minimizes eye strain and computer glare. An open ceiling exposes the structure, HVAC, electrical, and fire protection systems. In addition to making the space feel larger, the open ceiling connects occupants to building systems and reinforces the work that CPP does. A light paint scheme also opens up the space. Versatile, ergonomic workstations offer flexibility and enhance comfort. High work surfaces are available for employees who prefer either to stand or to sit in a higher chair. 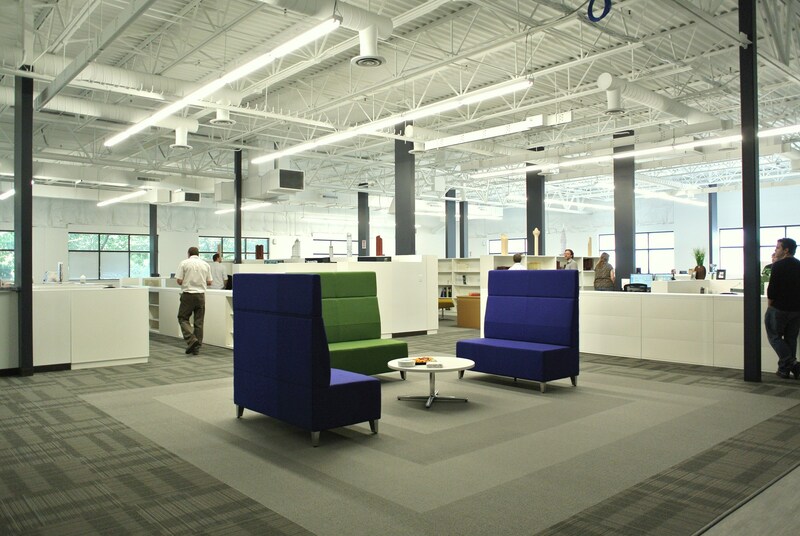 Unwanted noise is mitigated through varied directional workstations, tall workstation partitions, tall walls at library areas, and secluded spaces for tasks requiring substantial focus. Hubs and landmarks encourage employee interaction. Hubs were designed for both standing and sitting with different levels of privacy, while landmarks create stop-off points and promote interaction. The employee break room was designed to be a gathering and meeting area, not just a coffee bar. A large garage door turns the space into an indoor-outdoor facility on Colorado’s many mild, sunny days, extending the space outside. CPP’s new break room features kitchen appliances, ample counter space, and plenty of room to chat with colleagues. Photo coutesy of Rieko Ishiwata. While our wind tunnels remain at CPP’s original location in north Fort Collins, the new offices are more centrally located and are closer to Interstate 25, making CPP more readily accessible to our clients and other guests. An integrated suite of webcams, instant messaging systems, and video chat services link our wind tunnel technicians and experimental resources to CPP’s engineers, business, and administrative staff. And prominent displays of our many scale models offer psychological links to our history even as we look ahead to the future. CPP’s new offices represent just the first of many steps our company is taking to execute this exciting step change. We’re opening new virtual offices in the United States and around the globe to better serve our clients. We’re investing in major upgrades to the technologies that meet our internal logistical needs and our external service responsibilities. And we’re designing entirely new wind tunnels—from the ground up—to take advantage of the latest advances in automation and process management. CPP’s new offices create a vibrant work environment that equals the interesting work we do, contributing to our occupants’ feelings of confidence and status. Whether you’ve visited us before or have yet to make the trip, we invite you to pay us a visit and see for yourself the big changes at CPP. How many months in a year (numeral)?